Frank C. Feschino, Jr., Artist Illustrator, UFO Researcher and Author, The Braxton County Monster: The Cover-Up of the Flatwoods Monster Revealed © 2004: “There weren’t just a couple of UFO sightings on September 12, 1952. 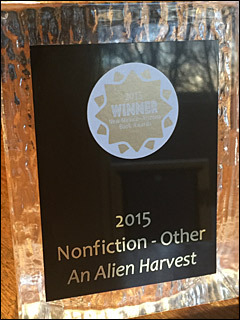 I found out that there were UFO sightings all over the Eastern United States, up and down the Eastern seaboard. 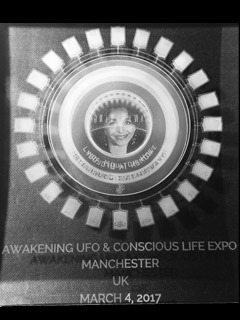 There were thousands of people who saw UFOs that day and night. September 13, 1952, Wilmington Sunday Star, Wilmington, Delaware. WASN’T THAT ONLY A COUPLE OF MONTHS AFTER ALL THE EXCITEMENT OF DISCS SHOWING UP IN THE NATION’S CAPITOL? That’s correct ­ the 19th and 26th of July, 1952. So, this (Flatwoods, West Virginia, and Gulf of Mexico jet disappearance) were just about six weeks later. On September 12, 1952, over the Gulf of Mexico, an F-94 C Starfire disappeared 70 miles off the coast of Tampa into thin air! I started researching an article I found in an old September 16, 1952, Daytona Beach newspaper. 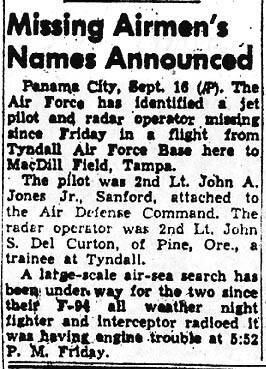 September 16, 1952, The Daytona Beach Morning Journal, Daytona Beach, Florida. I spent approximately eight years just researching this one incident and tying it into the Flatwoods, West Virginia, story. 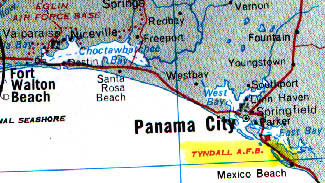 And there was even another incident that happened when other jets disappeared out of Tyndall AFB, Panama City. ARE THESE OCCURRING ON OR AROUND THE SAME SEPTEMBER 12, 1952, TIME OF THE FLATWOODS MONSTER? SO THE SAME DAY, ONLY AN HOUR AND HALF BEFORE THE FLATWOODS EVENT. 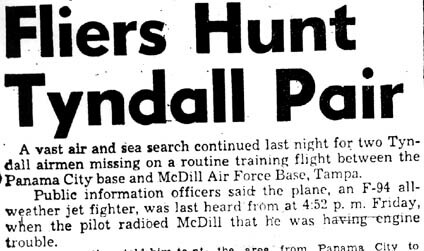 Right, a radar operator and pilot vanished with their advanced Lockheed F-94C Starfire jet off the face of the earth 70 miles off the coast of Tampa and MacDill AFB, after they took off from Tyndall AFB, in Panama City, Florida, on an alleged routine training mission with three other USAF planes. 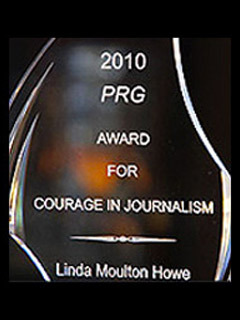 The story was picked up by several different Florida newspapers. There was a lot of information in the reports. These reports never reached outside the state of Florida, except for Oregon, where John Del Curto, the radar operator, was from. Official July 1952 USAF photograph of Lockheed F-94C Starfire, “an all-weather interceptor … on 24-hour duty protecting U. S. borders.” Primary armament were rockets called Aeromite 2.75 Folding Fin Aerial Rockets (FFAR), fitted with explosive warheads which made the Starfire more deadly. September 14, 1952, News Herald, Panama City, Florida. September 16, 1952, The Tampa Daily Times, Tampa, Florida. The newspaper misspelled the radar operator’s name. Frank Feschino talked with the family who confirmed it’s John S. Del Curto. THE ESSENCE WAS THAT THE PILOT, JOHN A. JONES, JR., AND RADAR OPERATOR, JOHN DEL CURTO, IN THE STARFIRE PLANE WERE BEING TRACKED ON RADAR? AND THEY DISAPPEARED, BUT THERE WAS NO CRASHED AIRPLANE AND THERE HAS NEVER BEEN ANY FOLLOW UP EXPLANATION ABOUT THE SEPTEMBER 12, 1952, INCIDENT? Nothing whatsoever. There was said to be a massive air and sea search for hundreds of thousands of square miles. These guys disappeared off radar into thin air. They were said to have had a flame out which means they ran out of fuel. The odd part about the whole story is that they never bailed out of the plane. WASN’T THERE SOME INDICATION, EITHER FROM THE RADAR OPERATOR OR FROM ANOTHER EYEWITNESS AT THE TIME, THAT THERE WAS AN ‘UNIDENTIFIED’ IN THE VICINITY OF THEIR PLANE WHEN IT DISAPPEARED? 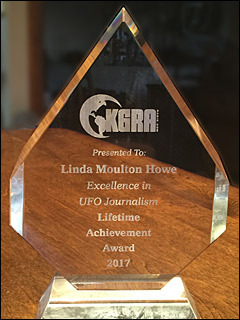 Well, I stumbled across this other thing ­ there was on the same page another story that had occurred involving a strange UFO object seen over Florida. But it was a couple of days later. But there was another article right next to the missing jet story about an ‘odd balloon’ found in the area of Tyndall AFB, Florida. In my book, I piece all of these stories together and made a timeline through the newspaper reports. 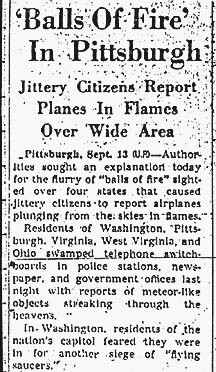 WAS THE STARFIRE DISAPPEARANCE THE FIRST ANOMALOUS EVENT ON THAT DAY OF SEPTEMBER 12, 1952? Involving military, it is. 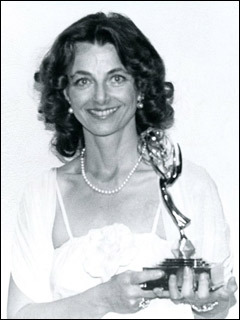 With jets. WHAT HAVE YOU LEARNED FROM THE BROTHER OF THE PILOT WHO WAS IN THE 1952 DISAPPEARANCE AND WHAT PROBLEMS HAVE YOU HAD IN TRYING TO FIND DOCUMENTS ABOUT THAT PILOT AND RADAR OPERATOR? 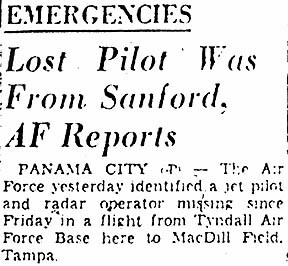 Over the years, I tried contacting different air force bases, trying to find out if there were any records about this incident (Starfire F-94C disappearance on September 12, 1952). I contacted Maxwell AFB. 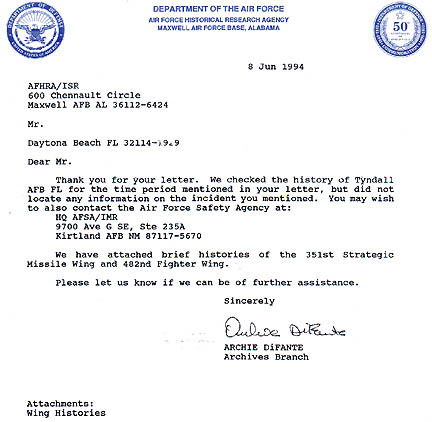 They wrote two letters back saying there were no records of this incident in Maxwell AFB Archives. As far as they are concerned, it did not happen. It could be classified for some reason. I don’t know. Maybe it’s lost, or got burned up (July 12, 1973 fire in National Personnel Record Center, St. Louis, Missouri.) 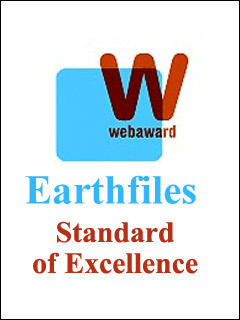 See: 12-17-04 Earthfiles. DID YOU GET CONFIRMATION ABOUT THE MILITARY SERVICE RECORDS OF THE PILOT AND THE RADAR OPERATOR? There are no records of these two men on the face of the Earth. Even in the Social Security Death Index, there is nothing. Maxwell AFB has no records of the incident or the men. This whole thing was just stuck away and buried. There is not one record on the face of the Earth in government files of these men being born, dying, being in the US Air Force, existing, period. They are completely gone as far as current government records are concerned. 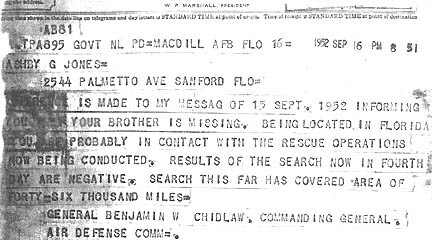 June 8, 1994, reply from Archie DiFante, Archives Branch, USAF Historical Research Agency, Maxwell AFB, Alabama, in response to Frank Feschino’s inquiry about the disappearance of USAF pilot John A. Jones, Jr., and his radar operator, Lt. John Del Curto. AS IF THERE WAS A DELIBERATE ATTEMPT TO ERASE THEIR EXISTENCE, AND THEREFORE, ERASE ANY LINK TO THIS EVENT? WHAT HAPPENED LATER TO CONTRADICT THAT? 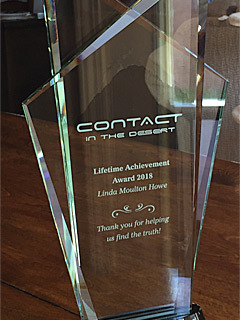 I contacted both surviving brothers of the radar operator and the pilot. I was lucky enough then to get copies of the original Air Defense Command documents sent by General Benjamin Chidlaw, Air Defense Commander in Colorado, and B. T. Kleine, who was from Tyndall AFB (3625th Flying Training Wing). I have copies of the letter and Western Union telegrams to the surviving families. 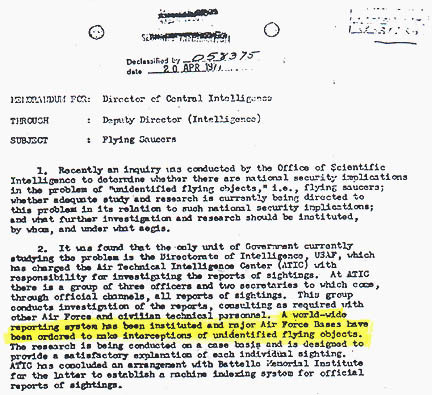 They contradict today’s USAF saying there are no records of such an event on September 12, 1952, and no records of the pilot and radar operator. And I found several newspaper articles about it! 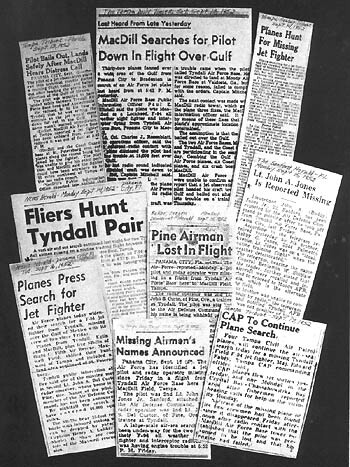 Nine Florida newspaper articles about the September 12, 1952, disappearance of the Starfire and its crew. 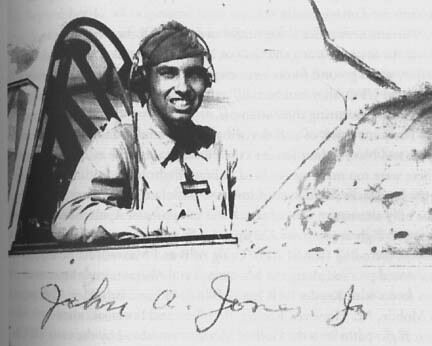 Montage assembled by Frank Feschino, Jr.
John A. Jones, Jr., 2nd Lt. USAF, in 1952. 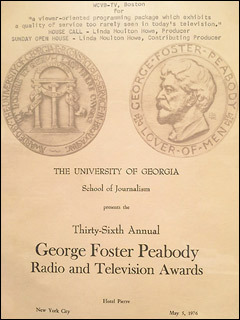 Photograph courtesy of his brother, Ashby Jones. 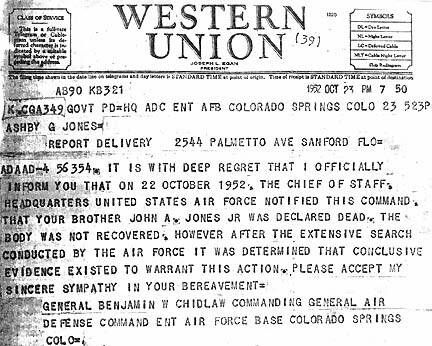 Above: September 15, 1952, Western Union Telegram to Ashby Glen Jones, brother of Starfire Pilot, John A. Jones, Jr., from General Benjamin W. Chidlaw (misspelled in telegram), Commanding General, Air Defense Command, Ent AFB, Colorado Springs, Colorado. Below: September 16, 1952, follow-up telegram from General Benjamin Chidlaw. These are the actual telegram copies given to me by the brother (Ashby Glen Jones, brother of Starfighter Pilot, John A. Jones, Jr.). YOU HAVE OTHER DOCUMENTS THAT INCLUDE LETTERS AND A COUPLE OF OTHER TELEGRAMS. Yes, follow-up telegrams and letters. 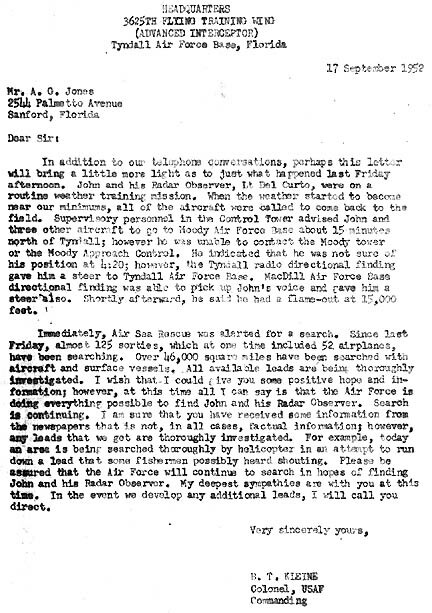 September 17, 1952, letter to Ashby Glen Jones about his brother’s disappearance from Col. B. T. Kleine, Commanding, Headquarters 3625th Flying Training Wing (Advanced Interceptor), Tyndall Air Force Base, Panama City, Florida. 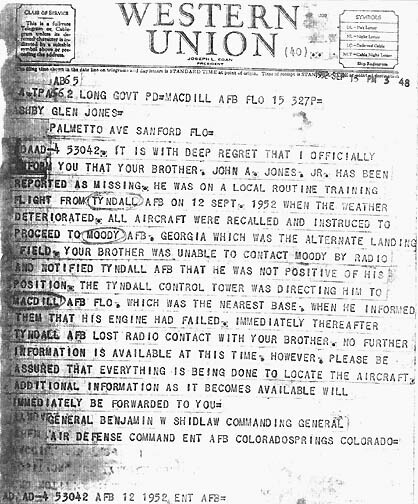 September 20, 1952, follow-up telegram from General Benjamin Chidlaw, Ent AFB, Colorado Springs, Colorado. October 23, 1952, follow-up telegram from General Benjamin Chidlaw, Commanding General, Air Defense Command, Ent AFB, Colorado Springs, Colorado. HOW COULD ALL OF THIS EXIST AND THE CURRENT MODERN AIR FORCE DENY THAT THESE NAMES EVER EXISTED IN THE MILITARY OR THAT ANY SUCH EVENT HAPPENED WITH THIS MUCH DETAIL WRITTEN IN A TELEGRAM BY GENERAL CHIDLAW? The story was obviously covered up massively. It’s mind boggling and disturbing that this can still go on 50 years after the fact. THAT THEY CAN TRY TO LIE BY ERASING EVENTS AND PEOPLE? Right, exactly. Something happened that night which was mysterious and disturbing to be covered up to an extent that 52 years later that the story still is buried away some place in the archives of the government. BECAUSE THEY THINK IT’S TOO SENSITIVE FOR THE PUBLIC TO KNOW? WHAT WOULD BE SO SENSITIVE THAT THE U.S. MILITARY WOULD NOT WANT ANYBODY TO KNOW? 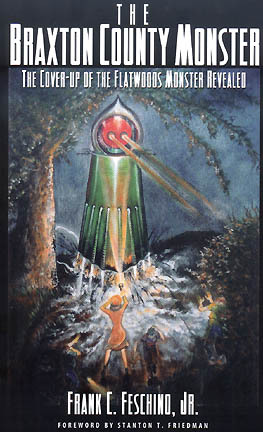 Click cover to order The Braxton County Monster: The Cover-Up of the Flatwoods Monster Revealed © 2004 by Frank C. Feschino, Jr., with Foreword by physicist Stanton T. Friedman. Next PostNext Abrupt Climate Change Occurred Worldwide 5,200 Years Ago.